Ian McCall writes so eloquently of the Nigerian groundnut pyramids in his memoirs ‘Sweet Pass Kerosene’, his personal history and memories of Nigeria. He makes mention of sherry and gin peppers and this weekend wonder is born. 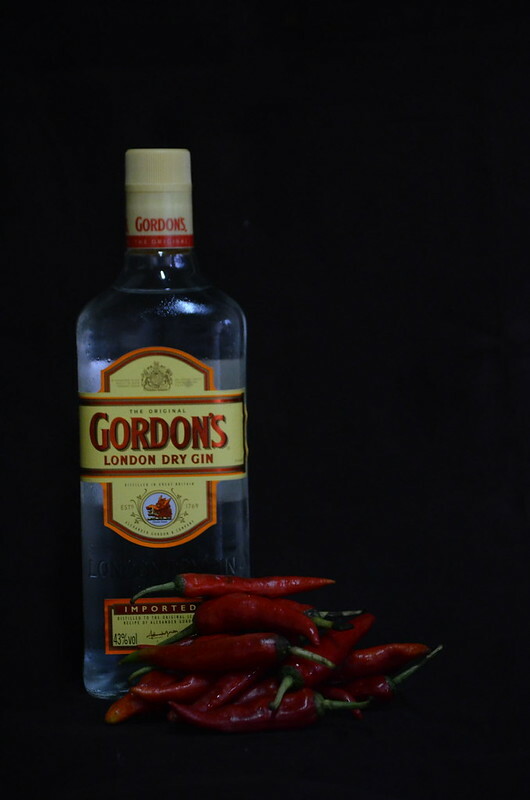 A weekend wonder that sees a hot sauce that uses Gin instead of vinegar to draw out the spicy flavours of the chilies! Nuts were served to accompany drinks at most times and, delight of delights, they were used to make a soup most nights of the week. It was accompanied by sherry or gin peppers. 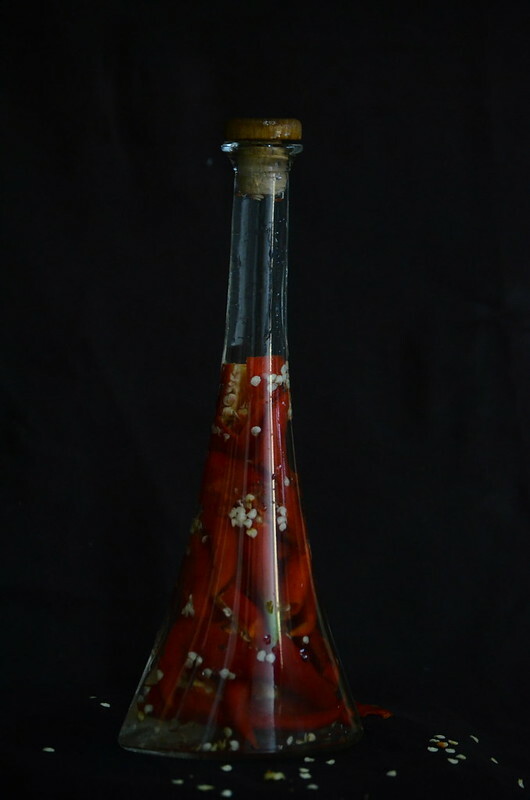 The peppers, capsicums, or Nigerian Birdseye Chillies as they were known variously or officially, were put in the bottom of a bottle containing sherry or gin and left for a few weeks until the combination of the hot spice and the alcohol reached an optimum taste and sharpness. It was then ready to shake on to the soup. Able Baker, an engineer in the Public Works Department, told the story of when he was working in Onitsha and staying in the Catering Rest House there, he had his own bottle of sherry peppers which was placed on his table at lunch and dinner. A visitor from the United Kingdom leaned across AB’s table and snatched the bottle and applied a liberal dose to his dish – and nearly choked. When the visitor had recovered from his paroxysm AB said to him ‘Maybe that’ll teach you to say “by your leave” next time’. I trawl the world wide web and sure enough, Sherry peppers are well known. All the rage on the isle of Bermuda. And available to buy on Amazon. Thanks to Saveur, I understand the history. And know now that the coastline of the Atlantic brought this sunny sauce our way. Like Hardtack, the biscuit that accompanied long voyages, this peppers are associated with sailors and seafaring vessels. Betsy Andrews writes in ‘Island Spice’, online for Saveur: ‘As it turns out, the story of sherry peppers sauce begins in the ship holds of Britain’s Royal Navy. Resourceful sailors would steep piquant chiles in barrels of sherry until the fortified wine was suffused with their heat, and then use the resulting seasoning to mask the taste of spoiled rations. Did I mention that my father was in the British Merchant Navy. And he drank Gin. I think. But he never did mention these peppers. Yes in Nigeria, we steep many things in dry gin, mostly for medicinal purposes. Herbalists and native doctors put roots and spices and herbs in locally brewed alcohol and in gin and apportion tiny shots for health. Years ago I had the pleasure of meeting Yeaton Outerbridge, a fourteenth-generation Bermudan whose family sailed from Yorkshire to Bermuda in 1620 and has been there ever since. His family has been making sherry-pepper sauce there for decades; indeed, the family’s name is so synonymous with Bermuda that there’s a saying that Bermuda is a string of islands connected by Outerbridges. A few drops of this potent liquid will enhance martinis, chowder, eggs, or shellfish. Though traditionally made with piquin chiles, which have a slow burn, this sauce is also lovely with tepin chiles, which are hot mamas with a flash-in-the-pan heat. Both chiles have a pretty orangey red color. Since I’ve explored the heat of Thailand and its famed Sriracha, and done the hot yellows, Madame Jeanettes or Camerounian peppers, I am not afraid. I’ve been there and back. De-seeded chilies, pickled them and cooked up a storm. Get a bottle of the finest gin. 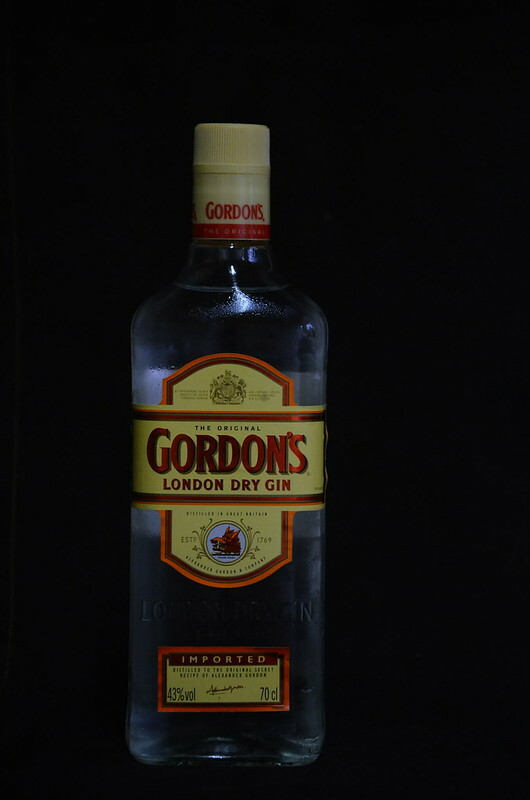 For me, I associate Nigeria with Gordon’s Dry Gin. Plus Gordon was my dad’s middle name, but first initial. G.C.A. He went by Chris. Gordon did. So Gordon’s dry gin it is. 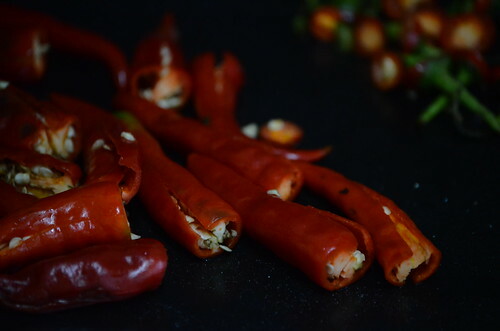 Grab some red chilies. Known here in Nigeria as atawere or sombo, named by the Western Yorubas. Also known as Capsicum frutescens. You haven’t much to do. Find a bottle you love. Split the peppers in half. Followed by copious amounts of gin. 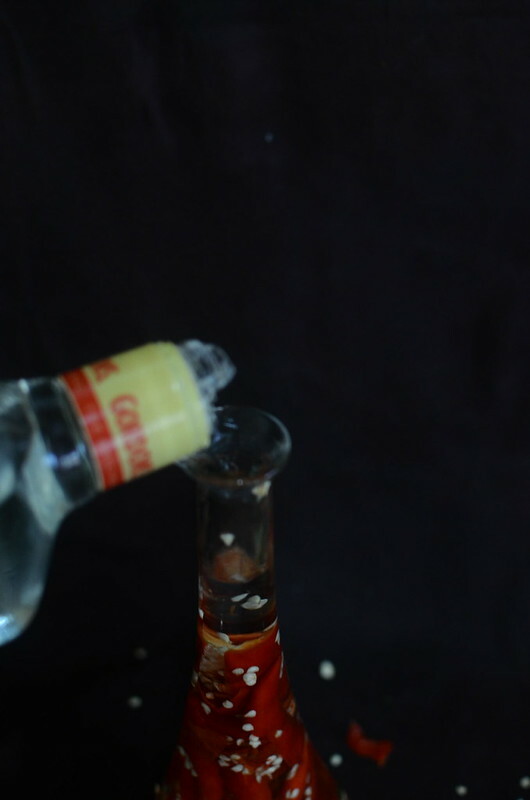 I broke the plastic part of the gin bottle in the hope that I could stuff the peppers into the bottle – it didn’t work! Take a swig if you like. I don’t dared. I coughed. Shocked by the harshness of the spirit as warmth coursed through my central system. Put the caps on both bottles. 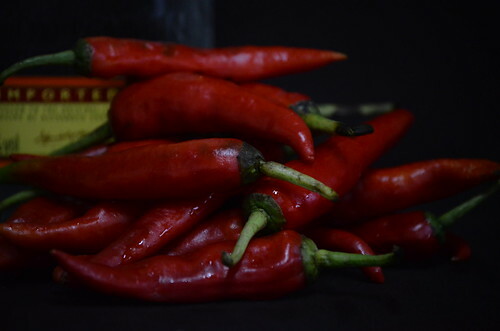 Set the chili peppers in a dark (not dreary place). Leave them to ‘age’. Brew. Mature. Like vanilla extract. Shake them maybe? Once or twice a week. Leave the fiery spirit be. Wait x weeks, and then douse your groundnut sauce in it. And then I’ll make a gin tomato sauce for pasta, a riff on the vodka version. I’m already thinking about poaching chunks of fresh fish in my Prawn and Champagne sauce which is currently lying at the bottom of my deep freezer, and top with this fiery sauce. In the book ‘Recipes from the African Kitchen’, written by English-born Josie Stow and photographed by her friend, Jan Baldwin, ‘Chile Vodka’ is one of the recipes. 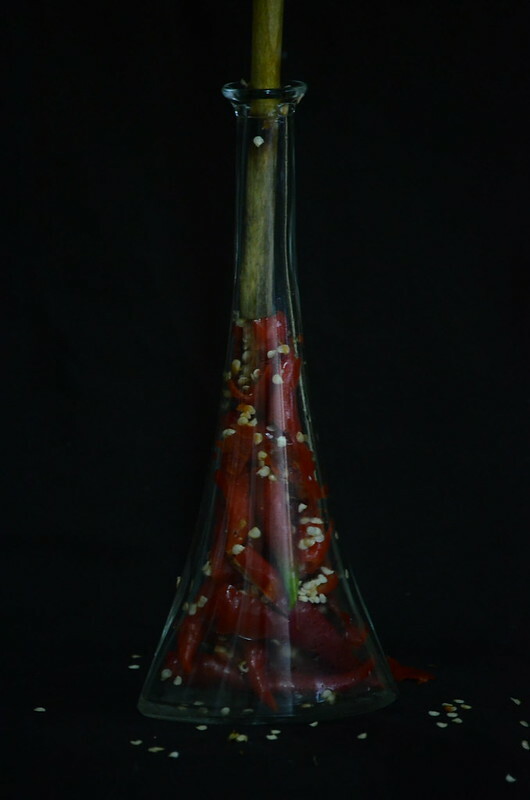 Here, red chilies are steeped in vodka and left in the freezer for at least 2-3 days to age, and preferably a week. 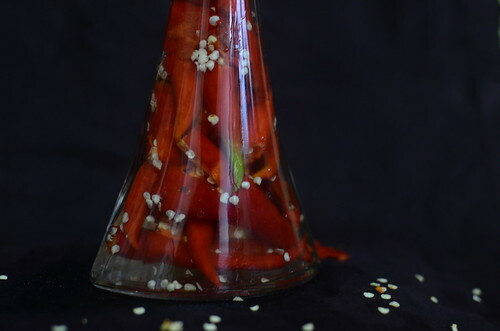 The Chile Vodka features in 2 recipes: Chile Vodka Bloody Mary and Gazpacho.